IMPORTANT! The sink must be supported by both the pedestal and the wall hanger. The sink is not intended to be supported only by the pedestal or hanger individually. 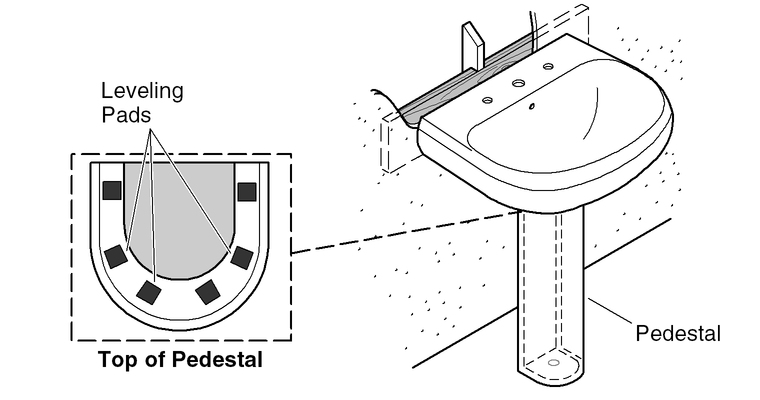 Adhesive leveling pads provided with the pedestal are intended to cushion the contact between the sink and the pedestal. If the bottom of your sink has tabs, place the leveling pads on all three points. The tabs are designed to provide point contact with the pedestal. The pads are 1/2" (13 mm) square pieces that are approximately 1/4" (6 mm) thick with an adhesive film backing. Additional leveling pads are available in kit 85448. The Rêve K-5026 and K-5027 bathroom sinks are designed to be a wall-mounted only. The pedestal option can be used, however the sink must always be mounted to the wall with hanger bolts. This sink has mounting holes through the backsplash of the sink that allow it to be lag-bolted to the wall. The lag bolts are visible after installation. This sink has mounting holes through the webbing inside the skirted area of the sink. The lag bolts are not visible after installation.